NYC, 04/17/2019, 6:30PM. 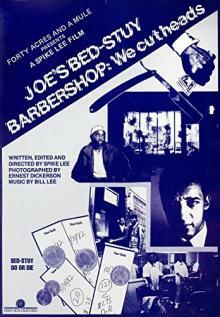 Joe's Bed-Stuy Barbershop: We Cut Heads (1983): Spike Lee's Master's Degree Thesis. The illegal affairs of a recently deceased barbershop owner gets passed down to his manager. 60 min. Director: Spike Lee. Starring Monty Ross, Donna Bailey, Stuart Smith. Lee submitted the film as his master's degree thesis at the Tisch School of the Arts.